3 banners flown over buildings. The associated shields also appear here, for easy comparison. Above each banner appears the folio number and the modern German version of the heading for the page on which it appears. Clicking on any number should take you to the Heidelberg University Library page for that folio, where you can see the banner in its original context. Banner and shield are carried by a horse. A man is standing by the horse's head. 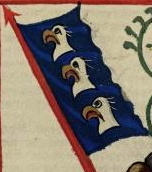 Banner and shield are held by the same man. This is a battle scene. The banner is being held by someone following the man bearing the shield. This is a battle scene. 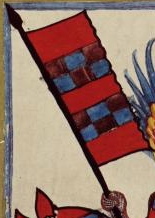 The banner is being held by someone following the man whose surcoat bears the escutcheon. This is a battle scene. 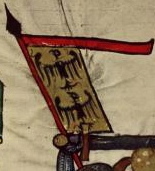 The fallen man holds the banner and bears the shield shown, but it is possible that (like the other standard-bearers shown in the book) he is not carrying his own banner. No one in the scene is carrying anything close to the device reflected on the banner. This scene shows a seated man speaking to one standing. The flag appears behind the seated man. It is unclear whether the shield, which appears at the top of the page outside the scene, is associated with him. This scene shows a seated man and three standing. The flag appears behind the seated man, who also holds a crozier. These flags protrude from finials on rooftops in a city that is being defended against attack in the scene. No one in the scene bears arms that appear to relate to them.